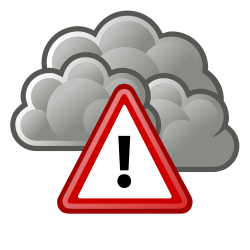 Severe Weather Growler is a weather alert monitoring service for Growl. This application runs on Windows (x32 and x64), but it should be able to send growl notifications to any Growl server. You will have to have the .net runtime (4.0 client) installed on your computer. This is a pretty easy program to use. And it’s 100% free. Heck, I’ll even give you the source code if you want it. Just install it, run it, select the county (see http://alerts.weather.gov for county codes) that you want to receive alerts for, and you should be good to go. This program polls the National Weather Service every 90 seconds to see if any new alerts have been posted. If so, you will be notified. Note that each alert type at the NWS is a different notification type within Growl. Therefore, you can set the type of notification for each type of alert. So out of curiosity, why do you have a System Tray icon constantly there? Considering the point of the program is to just run through Growl could you include an option to remove the tray icon? The icon needs to be there because once you minimize the program, you need a place to go to interact with the program, such as if you want to restore the UI so you can make preference changes. I am thinking about converting some of my programs to windows services, so that may lead to a way to get rid of the tray icon. Thanks for your suggestion though. I’ll keep it in mind. Wonderful Program. Can I put more that one ipaddress or host with a comma between? @MrDoom If you are talking about the growl server address, no you can only put one address in there now. If you need the notifications to go to more than one growl server, you can always use growl itself to forward to another instance of growl on a different machine. That being said, my “SystemMonitor” app has this capability to have multiple growl servers, so it is something that I can do. Maybe I will add it to my list of features for the next version. I’d love to see the source for this. Would you mind posting or sharing? Wow. I’m all about open source and all, but the truth is, this was literally my first C# project ever. I am not a very good coder at all, and I am actually a little embarrassed with a lot of my code. It is not documented very well, and it is not very cohesive. Do you really want to see it? You aren’t going to post it in “The Daily WTF“, are you?